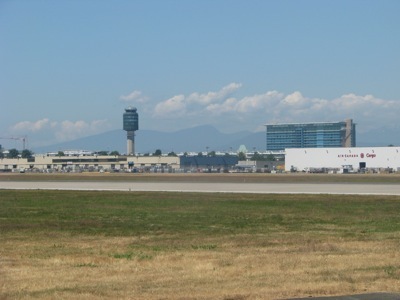 The Fairmont Vancouver Airport. Photo by Sue Frause. Hard to believe that The Fairmont Vancouver Airport is turning ten years old. I've stayed there numerous times, and it's one of my favorite Fairmonts. It's also the only soundproof, luxury hotel and spa located within YVR (Vancouver International Airport). And yes, there are views of the water, mountains and runways. It's an exciting yet serene place to stay before or after a trip. Or just for fun, even if you're not going anywhere, pack up your bag and spend the night. 10th Wedding Anniversary - Celebrating ten years of marriage? Book a guest room at their opening rates back in 2000 of $99 CDN. Bring your marriage certificate with you when you check in. Child's 10th Birthday - If you have a child turning ten, the $99 CDN rate will be good for a room with a runway view and/or great plane spotting.